This 40-page document outlines yearlong curriculum goals for 4 years of Common Core State Standards-aligned high school math. Each year is paced out with unit titles, and broken down into objectives. Some resources for units are included. 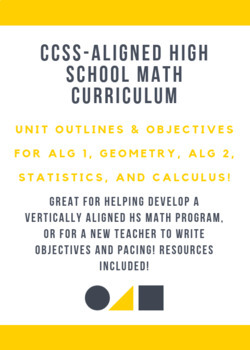 Objectives are written in student-friendly formatting and follow CCSS for Algebra and Geometry. Remediation courses, called "blocks" are also outlined for students who come to high school without advanced Algebra or Geometry skills. This is a great document to use to help a new teacher or department organize their scope and sequence for the year!